Around this time last year, I played through Saints Row the Third, a game with some strokes of brilliance, and some less than ideal aspects. SR3 was something of a flagship that took the series from being a cult hit, to a wild and ridiculous mainstream success. People decided they were a fan of a Grand Theft Auto style game that didn't take itself seriously at all. Then came the DLC. Then the game's published THQ went bankrupt. Placed in a decidedly strange situation wherin you have a wildly successful franchise, but a publisher who has gone broke, Saints Row developers Volition were put in a pretty awkward place. The result is that what was once intended to be a huge DLC expansion ended up being the standalone Saints Row IV. Some people were thrilled, some people were skeptical. Most just wanted more Professor Genki. As ever though, the question is, is the game any good? So let's start at the beginning. The story of the last 3 Saints Row games follows the growth of the Third Street Saints from a down and out street gang, to somehow becoming a mainstream media empire. 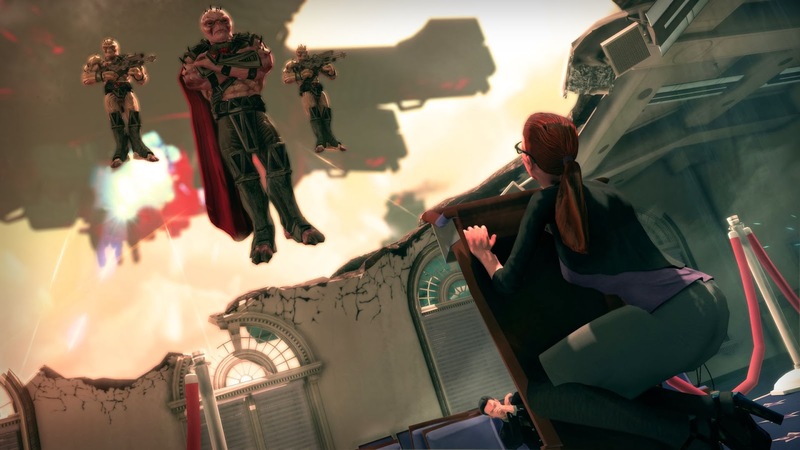 In SR4's opening sequences you become President of the United States, witness Earth be destroyed, get placed into a Matrix-like simulation, acquire super powers, and plot the downfall of the alien overlord Zinyak. And yet, this is all done as a tutorial. Sure, it makes sense to introduce the plot through gameplay, but this stuff should be epic. How do you make defending The White House from aliens boring? Make it a tutorial that doesn't have much to do with the game at all. How do we introduce an open world game? Clearly with a hallway shooter segment. Oh by the way, about that shooting? 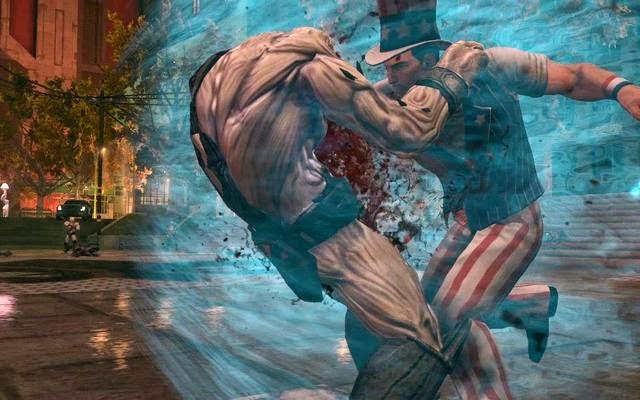 This game is about super powers, so don't sweat it too much. Now here, have a boring, needlessly protracted turret segment. Unfortunately, that's really the story of Saints Row IV. It inherits everything from Saints Row the Third, and the new is constantly at odds with the old. Saints Row the Third was about jacking cars, driving in the oncoming lane, shooting rival gangs with ridiculous missions, and doing silly activities. All of that is still in Saints Row IV, but what's the point? Why use guns when you can throw fireballs? Why steal cars when you can run faster on foot? That's cute, you can vault over fences... or you could jump 500 feet in the air, dive into the ground and nuke the fence into oblivion. Don't get me wrong, the super powers are definitely fun, there's no doubt., but being tacked onto an existing engine makes them feel significantly more clunky than in say, inFamous. At least until they throw you into a mission where you are without them. It's like they needed to do that occasionally just to justify guns even existing. At least they are pretty good about providing you with crazy vehicles or power armor to use part way through these segments so you don't miss your powers too much. As far as the game flow, things feel a lot less coherent than Saints Row the Third, too. You can cruise around Cyber Steelport and do many of the same or similar activities as in real Steelport. Except now there is this whole quest system. Many of the games' quests involve exiting the simulation and talking to a crew member on your ship in the real world. Which seems to me like it doesn't really accomplish much aside from adding travel and loading time to your task. Sure there's a story/atmosphere/otherlameexcuse reason to do it, but let's be real here. Saints Row IV's story is not trying very hard, it's barely there. This game is about being the super powered president. I guess you could say it's making some kind of statement about escapism, but I really don't care. It's just another example of the world with super powers being at odds with the world without. I want to stay in the simulation and run up buildings, don't make me work so hard to get to the fun parts. It seems an odd thing to do, considering a big part of Saints Row the Third's appeal was always making the player feel like they are doing something worthwhile with their time. As for the non-story quests, most of them simply involve doing the various activities strewn about Cyber Steelport. On one hand, this is pretty cool, because it means you have a little extra incentive/reward for doing said activities. Except I completed most of them before even getting the respective quests. As a result, the activities felt kind of soulless and unrewarding. Then I got a bit farther in the story, and unlocked a slew of rewards all at once. It just seems to me that the way the game is paced out is all over the place. You start out in a painfully linear/lengthy tutorial, pining for the open world. Then you get it, and are given a world with a million tasks and no incentives. Then you go back to the real world to do some story missions, and are rewarded with incentives in the cyber world. Surely at the very least, they should have restricted what activities you can do at the start a little more, and let the player narrow their focus a little. What I will say about Saints Row IV though, is that when it get it right, it does it in style. The game is absolutely littered with delicious nerdy references. They feel out of place in a franchise that started as a gritty GTA clone, but I'll not say no to a tongue-in-cheek Metal Gear Solid segment. What's more, Volition once again flex's it's ability to create moments that are absolutely perfect for certain 80's songs. Those moments where you can just rock out and be awesome to a song that fits the moment perfectly.. Well they are absolutely stunning. Really, that's what this game is all about. It's about being awesome, being silly, being nerdy and being ridiculous. Saints Row IV definitely does all of this, but I would personally argue that Saints Row the Third did it better. I think it comes down to expectations. 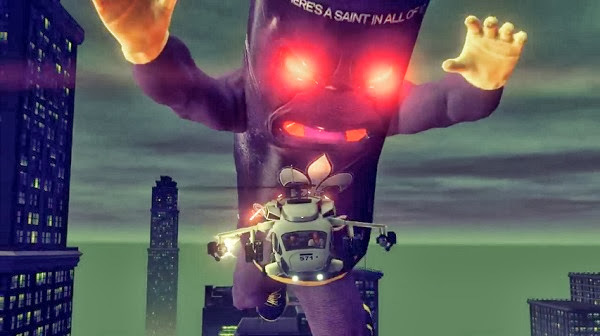 Saints Row the Third has tons of crazy in it, but it has a lot of the typical stuff, too. In contrast, Saints Row IV is thoroughly ridiculous from start to finish, and when everything is crazy, nothing is. The absurdity is still amusing, but not as much as it could have been. So I suppose this is a long winded way of saying that Saints Row IV is a decent game, but has a lot of issues. 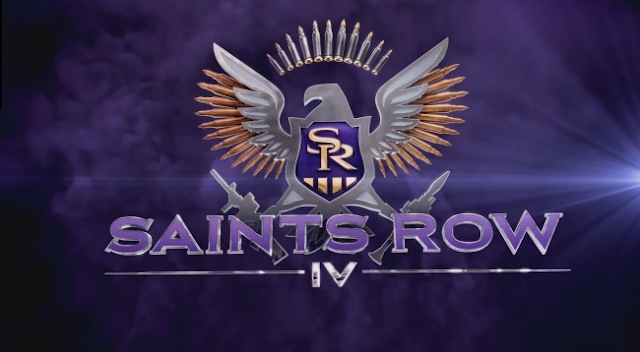 I would say that while Saints Row the Third was a consistently good game, Saints Row IV consistently rocks back and forth between being amazing and being pretty mediocre. Considering the rocky publisher issues Volition experienced during development, it's not entirely surprising that it would end up being a little spotty in places. After all, this was a game that was never intended to be a sequel. I kind of wonder if it shouldn't have stayed as an expansion, it seems to me that a lot of complaints would evaporate had that been the case. In the end of the day though, I did have an overall good time with the game, and I will look forward to any future Saints Row IP. The next time I want to play with super powers though, I'm definitely going to play a game that was built from the ground up with them in mind.